We, FEG Textiltechnik mbH, have our company head office in the city of Aachen (North Rhine-Westphalia, Germany). We are the leading developer of textile implants, which we manufacture exclusively in Germany. They are distributed worldwide under the brand name DynaMesh®. 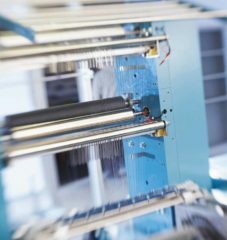 Whether it’s a matter of product development, manufacture, quality control, dispatch or advice, we undertake all production steps ourselves from spinning the filament (yarn) to final packaging. In this way, we achieve optimal results at every stage in the process. When manufacturing our products we place the utmost importance on compliance with Medical Device Directive 93/42/EEC and are certified according to DIN EN ISO 13485. Production takes place in clean rooms certified according to ISO 14644-1 and graded as class 7 and class C under the EC GMP Directive. Our range includes customised textile implants for modern hernia and stoma surgery and urogynaecology. At the same time, we offer special mesh implants for hernia repair and prophylaxis. Together with experienced surgeons we organise seminars and workshops. Our high-performance Research and Development Department is working on the next generation of products today. In association with the world’s leading research facilities and hospitals, our engineers work with well-known medical specialists to shape the future. In 2003, we were awarded the Aachen Innovation Prize. In 2007, our visible technology won an award (“Innovation competition to promote medical technology” by the Federal Ministry of Education and Research).